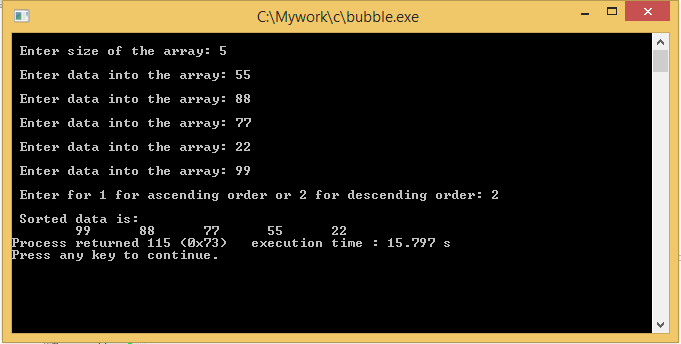 What is Bubble sort? Bubble sort is one of the basic and simple sorting techniques. Bubble sort is not advisable for huge amount of data. In today world, we may not be able to employ bubble sort technique because of the size of the data. But, learning a basic and easiest techniques will help us in improving our knowledge and will lay as foundation for further advanced techniques. This entry was posted in C and tagged algorithm for bubble sort, Bubble sort, bubble sort algorithm, bubble sort ascending order, bubble sort descending order, bubble sort example, bubble sort example in c, Bubble sort in c, bubble sort program, bubble sorting, bubble sorting in C. Bookmark the permalink.